By the title itself many of you might have guessed what this post is going to be.. No trip to Agra from Delhi would be complete without a visit to the two beautiful places Mathura and Vrindavan. And we decided the other day itself that we will visit these two places also. 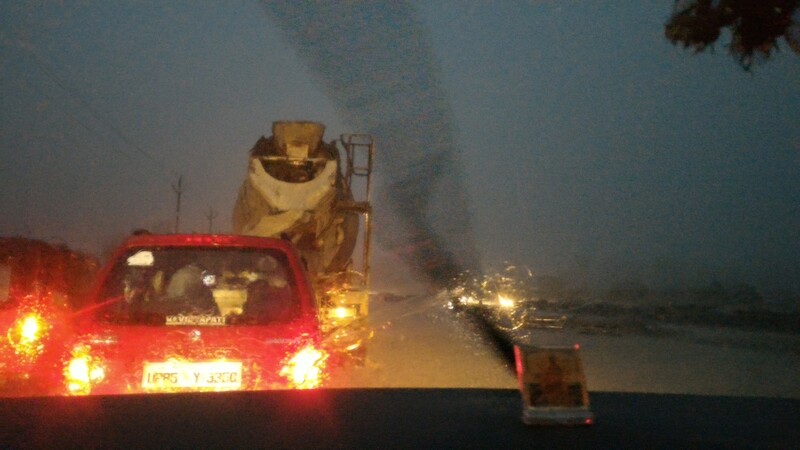 We started our journey to Vrindavan from Agra and it was still raining. After an hour’s journey we were onto a roadway leading to Vrindavan. The places along the roadway are beautiful and serene villages, covered with lush green paddy fields and other millet. The cloud covered grey sky, the lush green cover on the earth, and the drizzle made the scene more perfect. We crossed the villages and were out into the Vrindavan. It is a small town with many activities going around. We asked a few people how to reach the famous Bankey Bihari Temple and the people, mostly the Pundits (who are like the local guides) helped in locating the temple. The road leading to the temple is very narrow and is potholed. We could see a lot of people walking barefoot enchanting the Krishna mantra and not bothered about the drizzle. Our driver stopped the car at a decent distance from the temple as there is no way of us reaching the temple in a car. It started raining heavily while we were still waiting in the queue to enter the temple. The temple is located in an interior part and it was pretty crowded. We entered the main hall which is decorated with fresh flowers and colorful drapes. A mix of fragrance from the flowers and the incense sticks filled the room and the chants of “Hare Krishna” were echoing. Though we tried clicking some photos, we couldn’t as photography was strictly prohibited inside the temple. We hit the Yamuna Express way after a wait of an hour and half in the traffic and stopped for some food in the mid-way at Pizzahut though we didn’t eat any except a Gulab Jamoon on the Haldiram’s outlet beside it 😉 🙂 It was 11.30 by the time we reached our room and soon retired to our beds. My spirit burned to death. As the love of God once did to create men!! My first thought looking at the mausoleum.. The admiration of Prince Kurram towards Arjmand Banu Begum, King Shah Jahan’s love for his Begum Mumtaz Mahal and above all the lifelong love held by a man towards his love… As once said by the Great Poet Rabindranath Tagore, the Taj was indeed a tear-drop glistening spotlessly bright on the cheek of the time, forever and ever. 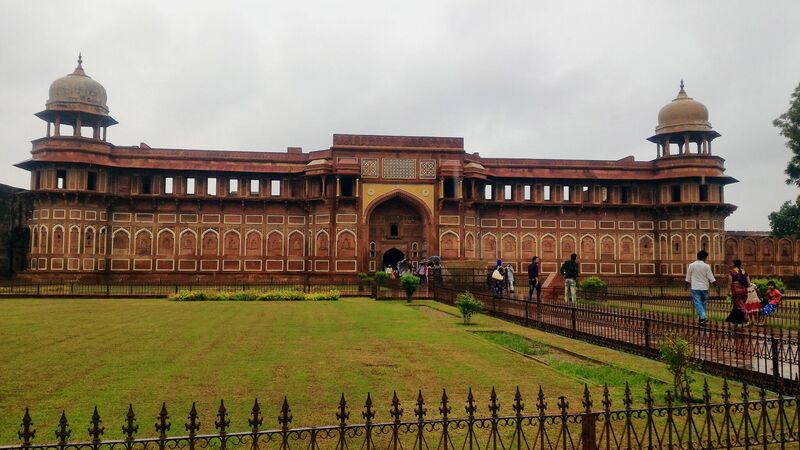 We passed the main gate which stood majestically in the center of the southern wall of the forecourt. The gate is flanked on the north front by double arcade galleries and the garden in-front is divided into four quarters by two main walk-ways. 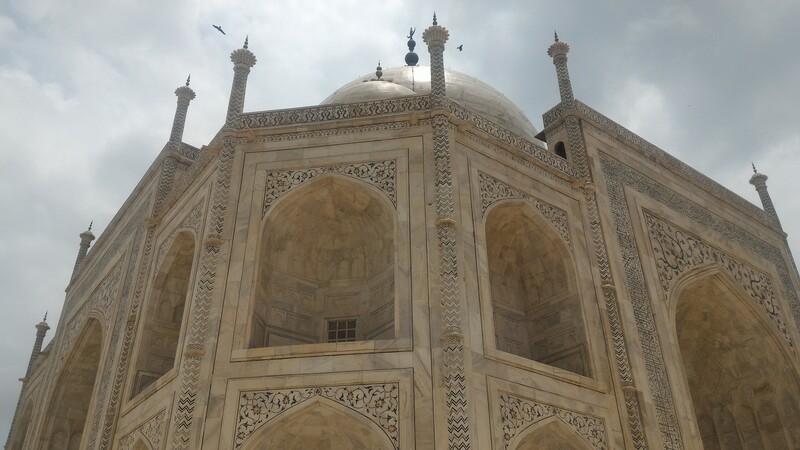 The Taj Mahal is located on the right bank of the Yamuna River in a vast Mughal garden that encompasses nearly 17 hectares and in the middle of the front yard is a long, narrow, rectangular man-made pond, reflecting the grand Taj Mahal at the end of it. Might be as it was a weekend and the weather was pleasant, there was a large crowd. 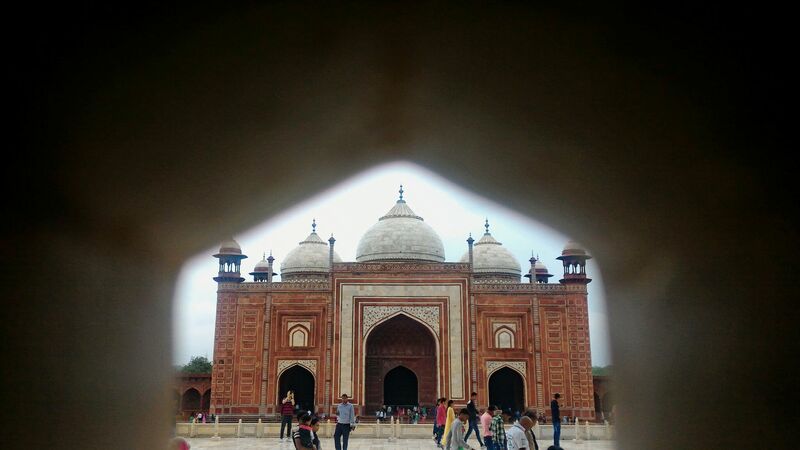 We started walking towards the monument which is raised on a square platform with the four sides of the octagonal base of the minarets extending beyond the square at the corners. 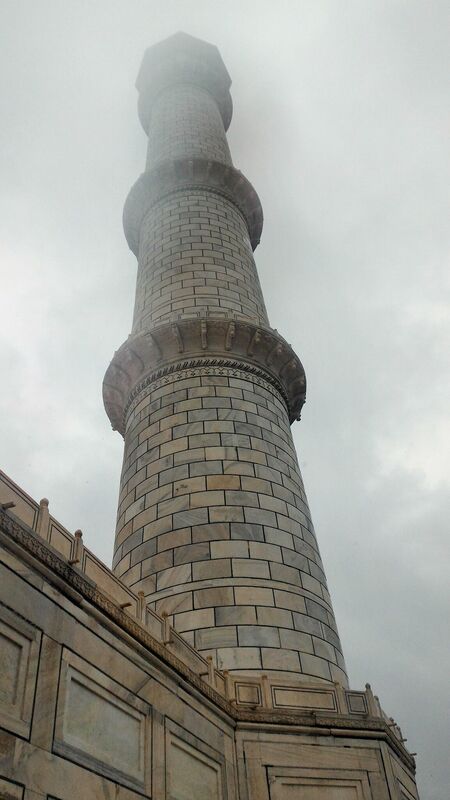 We climbed onto the platform through a lateral flight of steps provided in the centre of the southern side and went around the monument to have a closer look at the minarets and the mosques. The Taj Mahal is a perfect symmetrical planned building. 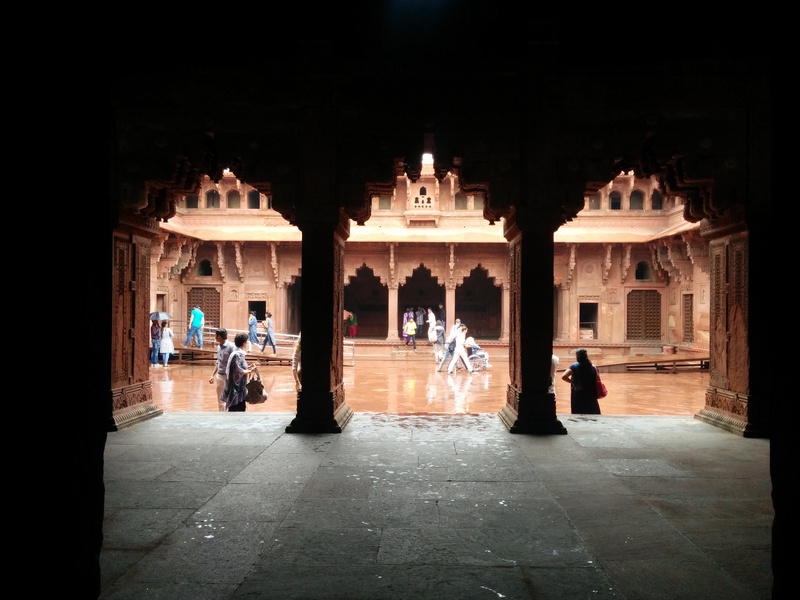 While the Taj has been built of white marble, the two identical mosques on either side of it were made of red sandstone quite contrast to the marble tomb. 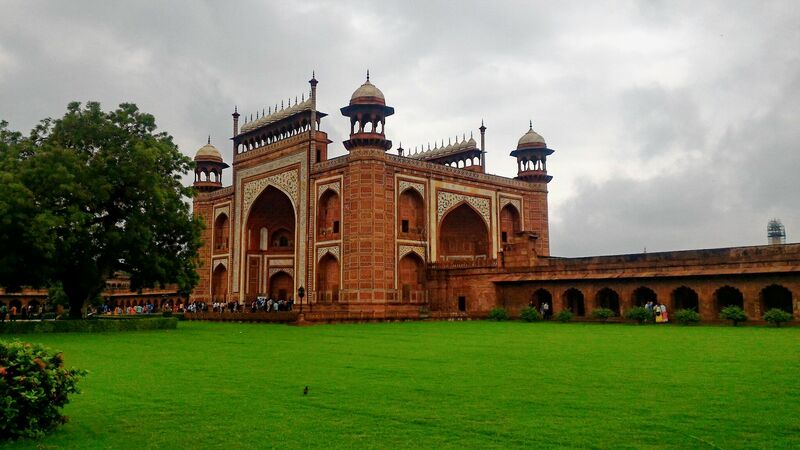 These four minarets provide not only a kind of spatial reference to the Taj but also give a 3D effect to the edifice. It is a giant masterpiece of art, too magnificent to look real. No picture of it can compare with this original copy. It was grayish as the clouds covered the sun’s face and was raining. All of a sudden it glared like snow when the sun was out of the clouds and for a moment I felt as if I was snow-blinded! 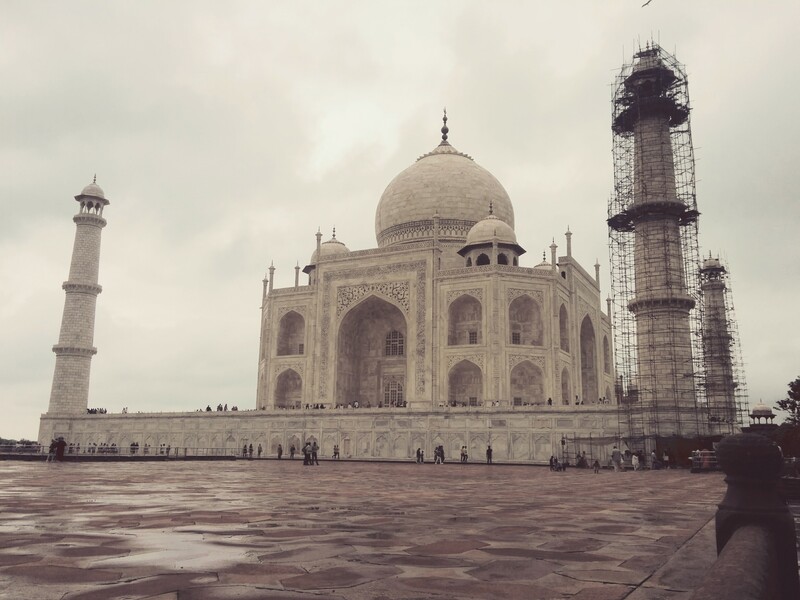 I can now only imagine how the Taj reflects during the sunrise, sunset and the moonlight. The various reflections of light come not only from the white marble but also from the colorful inlays, which decorate certain parts of the building. 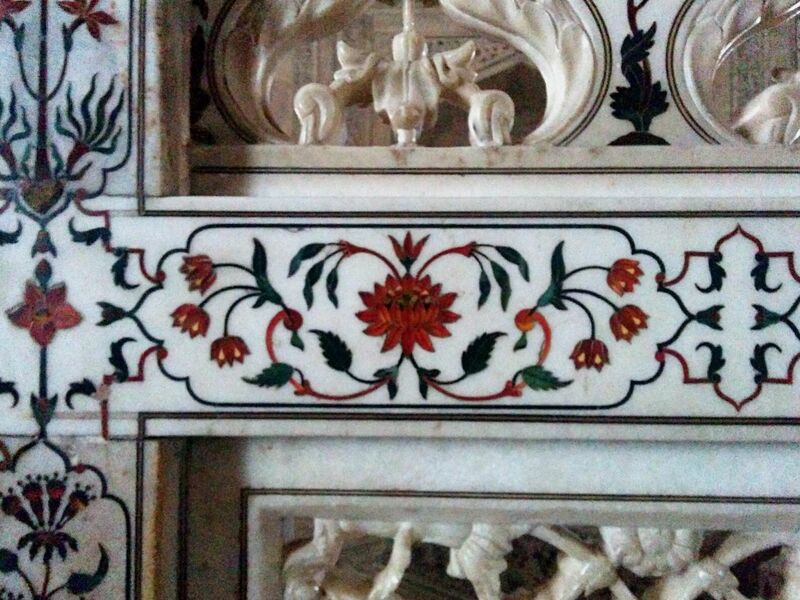 Red flowers and green leaves glisten in their delicate shapes carved in the white marble. Every tiny petal and thin stem is made of precious stones, which fit in the marble perfectly, leaving no cracks or bumps on the smoothest surface. Kudos to the craftsmenship! Soon we were inside the central tomb where the cenotaph of Mumtaz Mahal is in perfect center of the tomb chamber, and the cenotaph of Shah Jahan, which is greater than Mumtaz Mahal by the side of the latter on its west, and these were surrounded by a high wall protecting them from the visitors. Photography is prohibited inside the chamber, yet we can have some mobile clicks if there was a large crowd 😉 . 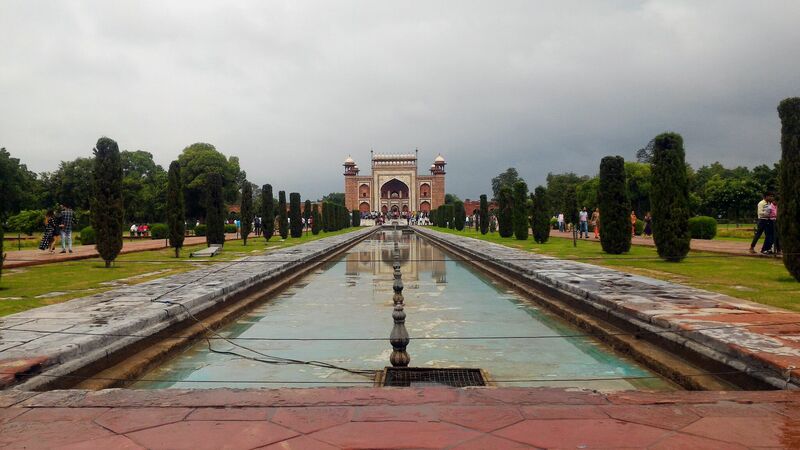 Once out, we went on a walk around the walk-ways and the pond in front of the Taj before we left the monument. 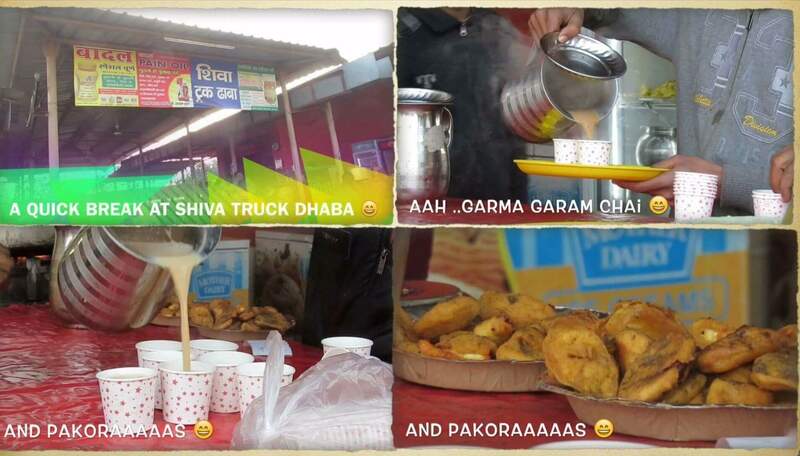 Our stop is at Shiv Truck Dhaba which is not so big nor so small. Few chairs were placed outside and few tables and chairs inside. As there was no space outside and was raining so badly, we chose to sit inside. While Neetha and I ordered Gobi paratha, our driver chose Aloo paratha. Something is missing, isn’t it? A pleasant rainy morning would be more pleasant with hot Pakoras, isn’t it? 🙂 🙂 We ordered for some pakoras too. After a heavy breakfast of Gobi paratha with butter and dahi and few pakoras with mint chutney, it’s time to resume our journey. 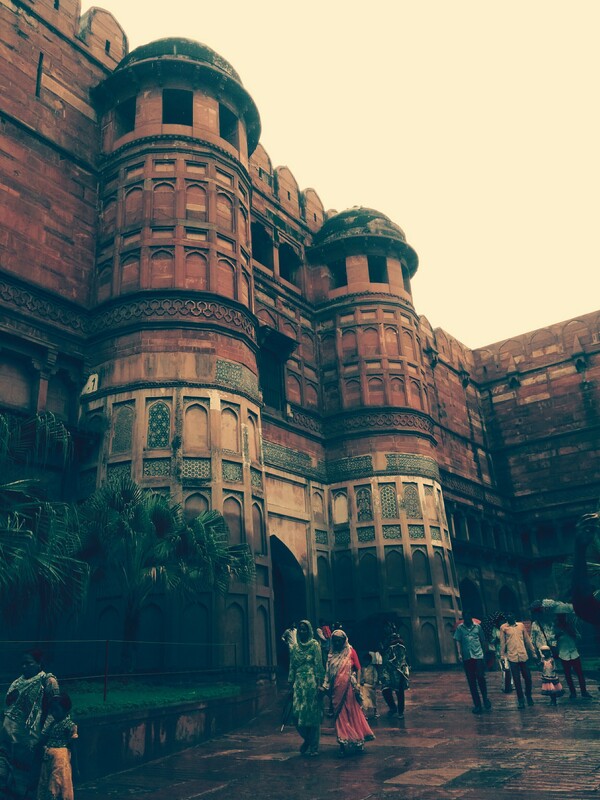 It was around 11.30, we reached Agra, which looked like a higher grade village and a lower grade town. Thanks to the chaotic traffic and the wide range of transport modes like mule-drawn carriages, tuk-tuks (named after the sound these carts make I guess), auto-rickshaws and trucks. It took us almost 30 minutes to reach our destination. Our driver explained us about the various parking lots and instructed us to come back to the same parking lot where he left us. Though we asked our driver to join us, he simply denied our offer and told us that he is not going to visit a muslim shrine ever :(. Perhaps, you might understand now why I told earlier that he is a staunch supporter of Hinduism 😉 . Soon, we were into the office to get our entry tickets and was followed by a group of guides asking us to hire one. But we simply denied. 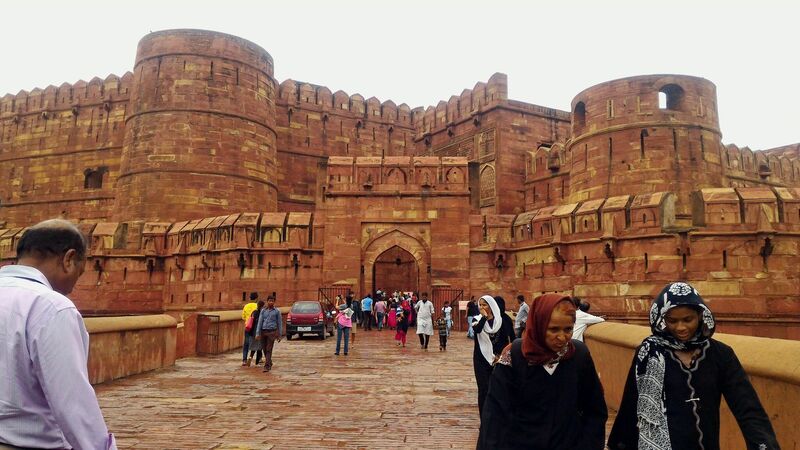 We bought shoe covers and stuffed them into our pockets and made a move towards the Battery car which carried us to the western gate from where we would be able to enter the Taj. It stopped raining for a while and we went through the security check soon after we entered the western gate. Our bags were thoroughly checked and we were let in. 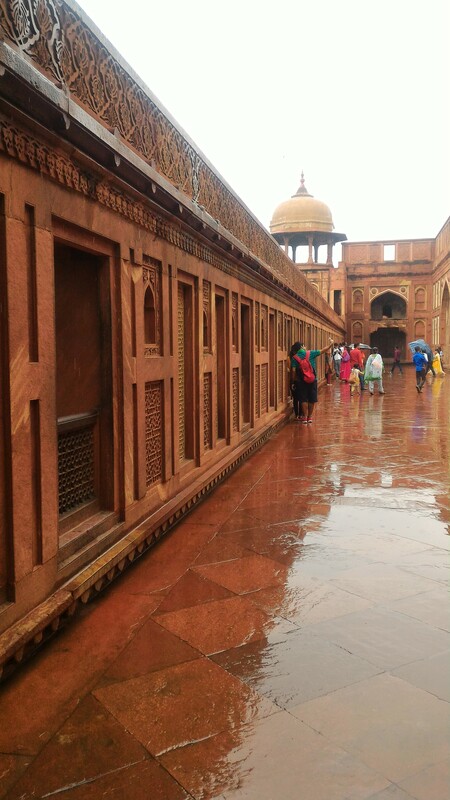 We started walking towards the inner gate and once we stepped into it, there stood the mighty “Taj – The Crown of Palaces” in front of us.